Fake Colours has made its appearance on the Steam store after being approved through the Greenlight process. 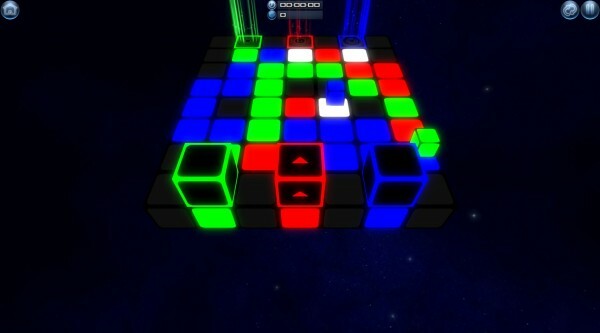 A simple 3D puzzle game, Fake Colours involves moving cubes to its relative colour at the opposite end of a grid. This doesn’t sound too complicated, however, as the player proceeds through the levels, new puzzle elements are introduced ensuring puzzles get more complex as the game goes on. Brought to you by a group of developers called Beyond-Limits-Games, Fake Colours is the first game they have released so lets see if they have created a good first impression. As highlighted in the overview, there is one main objective in Fake Colours. Three different coloured cubes – red, green and blue – need to traverse across a squared grid to reach their highlighted matching square. Cubes can only travel on the grid in their respective colours, so for example, a blue square cannot travel across a red or green path. The mechanics will change a little throughout the game, as you can make bridges to help cubes cross different coloured routes and smaller cubes that change the colour of the cubes that pass through them. These new elements of gameplay will be explained in a text tutorial before the levels that introduce them so don’t worry too much if it sounds confusing at first. Once you solve the puzzle, you will be presented with the time and number of moves that you completed it in. 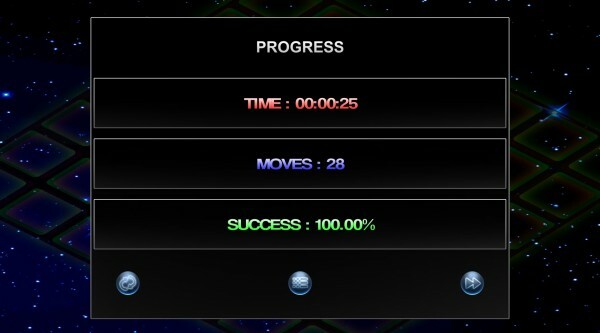 If you score 100% on the puzzle, it means that you finished the puzzle in the lowest amount of moves possible. This is where the replay value of Fake Colours will be found. Perfectionists will definitely strive to get 100% in all of the levels and this is by no means an easy task, as in the later levels there are a plethora of possible routes you can take. 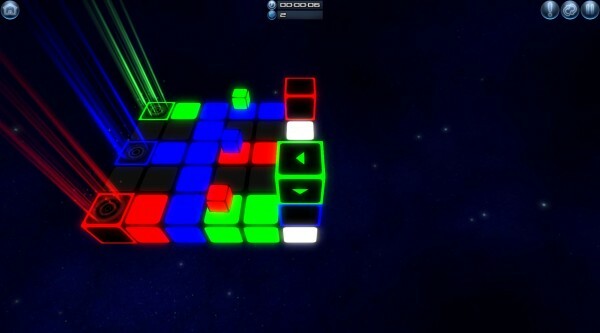 Once you have finished all 30 puzzles, a time attack mode will be available to play where you can attempt to beat the puzzles as quick as possible. I would have liked to have seen some kind of multiplayer element, such as a versus mode to see who can finish a puzzle first or some leaderboards for the time attack mode. The single player though more than makes up for this, puzzles in general are created well and the trickier ones can cause a few head-scratching moments as you deliberate your next move. The audio is a little limited in Fake Colours, from the music to the sound effects you will encounter when moving the cubes around the board. 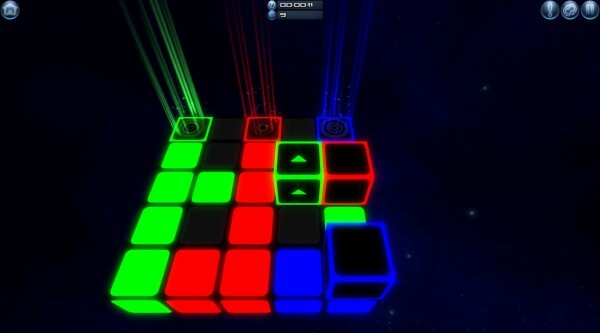 Although the electronic track during the main level mode is relaxing and suited to the gameplay, it tends to get stale and monotonous very quickly as it’s on an endless loop. Understandably, the soundtrack to the game is not the highest of priorities in the development of a puzzle game, but a larger selection of music tracks would have been nice to see. Graphics are clean and sharp with a neon-like presentation. This suits the space background very well although there is only one background to look at throughout the entire game. It’s understandable that the background has to be kept in a uniform colour tone as too much colour may confuse the player throughout the levels, however, just a couple more backgrounds would do wonders to keep the game fresh and inviting. The least pleasing element of the visuals is the presentation of the menus. They are large and use both bland fonts and colour. They appear to be rushed and tacked on at the last minute leaving the space management of the title screen non-existent. Besides that, the title screen gives off an ‘amateurish’ feel, certainly not good for a first impression. Players have two graphical presets – low and high – to choose from, but due to the content of the game they are the only options the developers needed to include. On the other hand, the launcher offers a host of resolution options to select and windowed mode is present. Fake Colours is a solid first entry from Beyond-Limits-Games and offers a competent puzzle experience. Once you get past the poorly presented menu and level screens, you will find a nice collection of puzzles to complete and perfect. It remains to be seen if there will be more content available in the future, but I feel at the price it’s available for now, it’s adequate for the game in its current state.